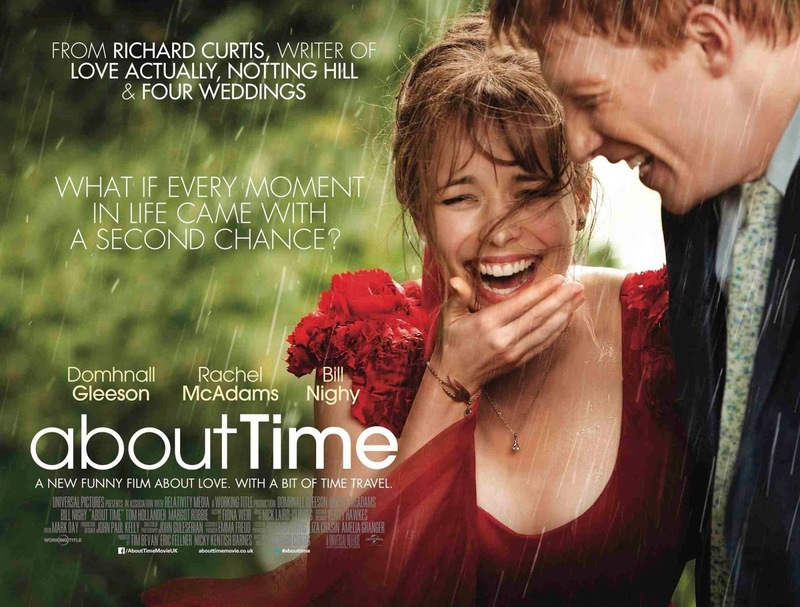 Richard Curtis perfected the art of the 21st century romantic comedy in “Four Weddings and a Funeral,” “Notting Hill,” and “Love Actually.” They were witty and sophisticated and had posh British accents that made them seem twice as witty and sophisticated. They were filled with of pretty people wearing pretty clothes in pretty settings, seasoned with self-deprecating humor, magnificent friendships, pop-y soundtracks, and happy ever after endings. 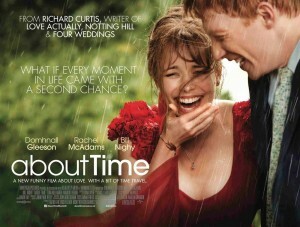 “About Time” has all of that, plus a twist. I don’t mean the addition of a fantasy time travel element, thought that is something of a departure. The real twist is that the important love story here is not between man and woman but between father and son. Oh, there’s a romantic love story, of course, and it’s the part that’s featured on the poster. Tim (Domhnall Gleeson, son of the Irish actor Brendan Gleeson and best known as one of the Weasley brothers in the “Harry Potter” films) lives in Cornwall with his family, a blissfully happy group that includes his slightly starchy mother (Lindsay Duncan), slightly dotty but impeccably dressed uncle (Richard Cordery), wild child of a sister (Lydia Wilson), and book-loving, family-loving dad (the indispensable Bill Nighy). Dad explains to Tim that the men in their family have the ability to travel through time. There are limits, of course. Like “Quantum Leap,” he is limited to his own lifetime. He can’t go back and meet Queen Victoria or ride a dinosaur. And, as Tim will spend the rest of the movie discovering, while he can go back to correct a mistake, the ripple effect of even the tiniest change may have very big consequences that are not so easy to fix. It may sound all very precious and cutesy, and it is, with Curtis’ trademark adorable eccentrics that are less adorable than he intended. Even an English accent can only make up for so much. Tim’s use of his time travel powers to make up for various gaffes is entertaining in a “Groundhog Day”-lite sort of way. (There’s something rather meta about a feeling of deja vu in these repeated, slightly improved encounters.) The romance between Tim and a pretty American named Mary (Rachel McAdams), while refreshingly free of the kinds of agonizingly silly misunderstandings that plague most romantic comedies, is on the bland side. The first meeting with Mary’s parents is supposed to be awkward and funny, but it’s just awkward. Things get more interesting later, as Tim and Mary get married and start a family. The stakes are higher and the choices are more complex. It is in the third act when things start to get interesting, because that is when the focus shifts to the father-son relationship. Curtis, who says this is his last film, opens up his heart for a piercingly bittersweet engagement with the big questions of who we are, making peace with not being able to fix everything for everyone we love, and finding a way to make pain and loss deepen us. Parents should know that this film includes sexual references, some explicit, and some sexual situations, very strong and crude language, car accident, and a sad death. Family discussion: If you could go back in time, would you correct a mistake or take time to enjoy what already happened? Why did Kit Kat have such a hard time making good decisions? 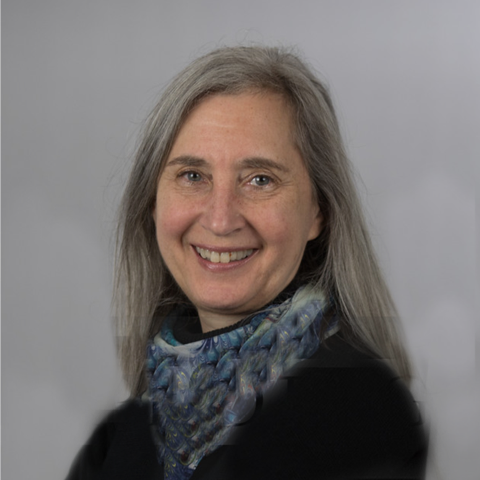 Was there anything her family should have done differently to help her? Maybe it’s just me, but I think this may be the worst idea for a movie intended for children I have heard since the one about the kid bank robber. 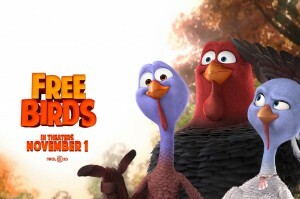 Does anyone think it makes sense to horrify children just before Thanksgiving with a movie about two turkeys who want to go back in time to prevent centuries of turkeys being eaten to celebrate America’s oldest holiday? Will children who see this movie burst into tears at Grandma’s house and insist on eating pizza for Thanksgiving dinner? Food is everyone’s favorite part of holidays, a turkey named Reggie (Owen Wilson) tells us, “unless you are the meal.” Reggis is something of a Chicken Little, telling the other turkeys that they are being raised for slaughter, but they do not believe him. They think that the farmer is their friend, and they envy the lucky birds he takes away from the flock because they think it is a special treat. The President of the United States arrives at the turkey farm with his little daughter for the annual photo op “pardoning” ceremony. As happens in real life (but at the White House) an especially handsome bird is presented to the President, who smiles for the cameras and sends it to a petting zoo while the rest of the flock is sent to the butcher. The President’s daughter (Kaitlyn Maher) is a brat who is always obnoxiously throwing a tantrum to get her own way or bizarrely going to sleep on the spot (she might want to ask her pediatrician about narcolepsy at her next check-up). She likes the scrawny Reggie and insists that he not only be pardoned but that she get to keep him at Camp David as a pet. Reggie is very happy, ordering pizza delivery and luxuriating in a terry cloth robe with the Presidential seal, until he meets another turkey named Jake (Woody Harrelson), who wants to go back in time to the first Thanksgiving, with the pilgrims and the Native Americans, to persuade them to start a different tradition by eating something other than turkey for dinner. They end up in an egg-shaped time machine adorably voiced by George (“Star Trek”) Takei, and soon are back to the Plymouth Colony in 1621, where they have to rally the wild turkeys who are the ancestors of today’s highly cultivated birds. The leader’s spirited daughter is Jenny (Amy Poehler), a practical-minded turkey who handles her lazy eye problem with aplomb. Hiding somewhere inside the over-plotting, time-travel anomalies, inconsistent characterization and tone, and family-unfriendly themes of animal slaughter there are some brief moments of humor, but the premise is so ghastly that even that feels hollow. It is supposed to be about sensitivity and empowerment but it comes across as callous and pushy. Parents should know that sensitive viewers may be disturbed by the theme of killing turkeys to eat on Thanksgiving. The movie includes cartoon-style peril and violence, some with guns, mostly comic but minor characters are injured and killed and there is a sad death of a parent who sacrifices himself. There is brief crude humor including joke about developmental disabilities and mixed marriages. Family discussion: Why does Reggie question what is going on when the rest of the flock does not? Why was it important to learn about Jake’s past? Previous PostPrevious Trick or Treating with E.T. Trick or Treating with E.T. Previous PostPrevious Happy Halloween from Casper and Wendy! Next PostNext Trick or Treating with E.T. Happy Halloween from Casper and Wendy! Previous PostPrevious Happy Halloween 2013!